Have you recently purchased a vehicle and need to transfer ownership? Transfer of a vehicle logbook is now easy and takes less than a week at the Kenya Revenue Authority. A duly filled and signed transfer from "C" obtained from the Road Transport offices in Times Tower, Nairobi, Customs House, Mombasa or the District Commissioners office. You also download this form from this KRA page. The original logbook: one is expected to fill up the first vacant 'change' giving his/her full name, address, and signature. Valid insurance cover. The copy that the insurance company provides. Both purchase tax and transfer fee in accordance with the engine capacity rating of the vehicle. This information is available at the back of Form C.
Copies of PIN for both seller and buyer. 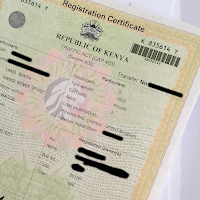 Once you have all these documents, lodge them with Road Transport Offices at Times Tower, Nairobi, and Customs House, Mombasa or at any District Commissioners Offices. There are genuine brokers who charge a small fee deliver the documents to the Road Transport Offices. Only work with people who have been referred to you and come highly recommended. There are many crooks in Nairobi who will take your money and disappear. How to perform an online vehicle logbook search.